Lieutenant Colonel Jon Graff is currently serving as the Professor of the Military Science for the Reserve Officer Training Corps (ROTC) at the New Mexico Military Institute in Roswell, NM. He is a 1991 graduate of the United States Military Academy and was commissioned as a 2nd Lieutenant in the US Army as an Infantry Officer. LTC Graff’s assignment history is as follows. His first assignment was with 2/325 Airborne (ABN) Infantry (IN) Battalion (BN), 2nd Brigade (BDE), 82nd ABN Division (DIV) at Fort Bragg, NC where he served as a Rifle Platoon Leader, Rifle Company Executive Officer (XO) and Anti-Armor Company XO. LTC Graff’s next assignment was with 2nd Squadron (SQDN), 11th Armored Cavalry Regiment at Fort Irwin, CA where he served as the SQDN Assistant Operations Officer (A-S3), SQDN Adjutant (S1), and Commander for Hotel Company and Headquarters and Headquarters Troop (HHT), 2nd SQDN. After his command, LTC Graff was one of three US Army Captains selected to receive an Olmsted Scholarship and studied at the Technical University of Dresden in Dresden, Germany for one year. His next assignment was with the 2nd Simulations Exercise Group, 75th DIV at Fort Sill, OK where he served as the Senior Maneuver Trainer and Deputy Task Force Commander training Regimental, Group and Brigade staffs within 5th US Army for deployment. Following graduation from the US Army Command and General Staff College at Fort Leavenworth, KS, LTC Graff deployed to Kirkuk, Iraq as the BDE Supply Officer, (S4) for the 2nd BDE, 25th Infantry Division. He then served as the BN Operations Officer (S3) and XO for the 1st BN, 27th IN BN, Wolfhounds, at Schofield Barracks, Hawaii during their transition from a Light Infantry BDE to a Stryker BDE. LTC Graff was then selected to be the Aide de Camp for the Commanding General, US Army, and Pacific. After completing duty in Hawaii, LTC Graff was selected to command the 1st BN, 310th IN at Fort Bragg where he trained Provincial Reconstruction Teams for deployment in support of Operation Enduring Freedom in Afghanistan. 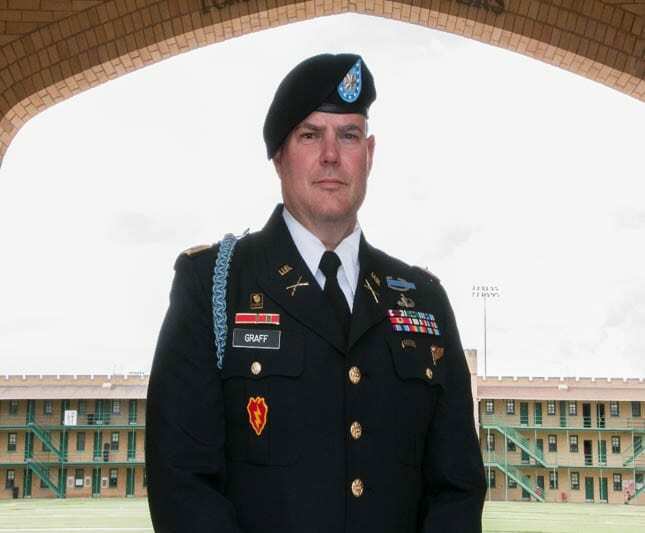 LTC Graff reported for duty as the Professor of Military Science for New Mexico Military Institute ROTC in May 2011. LTC Graff is a graduate of Ranger School, Airborne School, Jump Master School, Pathfinder School, the Bradley Leaders Course, the Basic and Advanced Infantry Officers Courses and the US Army Command and General Staff Officer College. LTC Graff has a Bachelors Degree in Russian Language Masters Degree in General Military Studies from the Command and General Staff College. He has the standard awards and decorations expected of an officer with a 23 year career. He is married to the former Sandra (Sandi) Thrower from Rockingham, NC and they have six children: Kirk, Caleb, Jonah, Keri, Annika and Jason.